Side Note: Check out our dogs in Creator-Owned Heroes #3! Well in case you needed another reason to pick up Creator-Owned Heroes, check this out: In #3 our dogs, my writing buddies, are featured! Joey (left) and Dara (right) support creator rights. 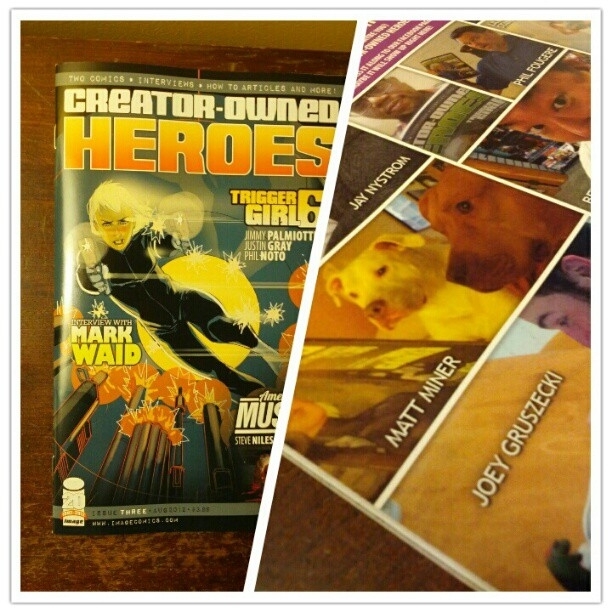 Creator-Owned Heroes is one of the very best monthly comic magazines featuring 2 stories from top talent in the comics industry, interviews, columns, tips, and other goodies. Go give ’em a LIKE on Facebook and then head to your local comic shop or over to ComiXology and give ’em a LIKE with your wallet!